By: Rachel Pillow | Photos courtesy of Scofflaw Brewing Co.
Scofflaw Brewing Co. definitely embraces the irreverent spirit of their name. Take one look at them and you’ll quickly see that this group doesn’t fit into any kind of “standard mold.” The Atlanta-based brewery, founded by Matt Shirah and Travis Herman, opened its doors in Westside Atlanta in June 2016. Just two short years later it has not only become a local household name, but has been called a U.S. brewery to watch, has been featured in Fortune, Garden and Gun Magazine, Beer Advocate, Draft Mag, The Bitter Southerner, Paste Magazine and USA Today, and has surpassed every sales goal and expectation, recently tripling capacity to keep up with demand. Shirah and Herman have come a long way from the first batches of their signature beer, Basement IPA, which was brewed (and named) in Matt’s mother-inlaw’s basement. 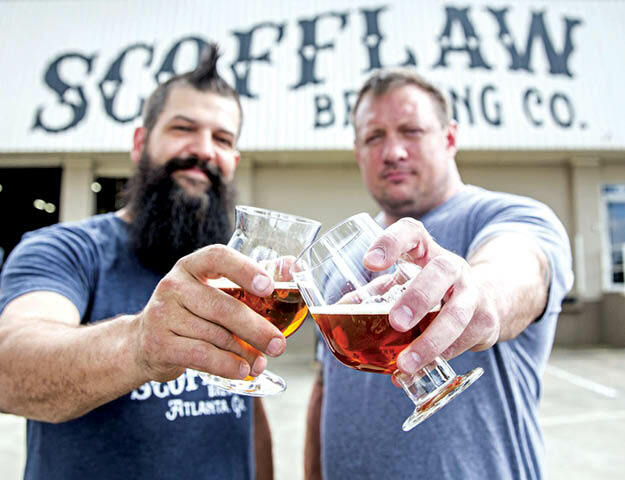 “Where beer, friends and family meet.” Scofflaw Brewing has become a popular hangout spot in Westside’s Bolton neighborhood, drawing in craft beer fans from all over metro Atlanta. We want people to come here and enjoy a local product. We’re brewing beer for people in the South,” said Shirah. And while you’ll certainly find a variety of offerings on Scofflaw’s tap wall, IPAs are clearly their forte. They have become known in the Atlanta beer scene for big, juicy, hoppy, hazy IPAs that deliver a citrus or tropical punch. And, you won’t find them veering too far from that. To date, they have brewed 40-50 unique IPA recipes. Scofflaw’s original and still-best-selling IPA began in a home brew setup in Shirah’s mother-in-law’s basement. Shirah said she wasn’t sure what was happening down there, that she probably thought it was a meth lab or something – she would close all the windows when guys came over to work on her pool out back. The best way to see what they’re all about is to make the trek ITP to the brewery, open daily starting at noon or 1pm on Sundays. They encourage you to bring your families and make a day of it. “Kids are zipping around on scooters, people bring in picnics and just camp out for the day, we see pop-up tents and umbrellas out there…it feels like a beer fest every weekend here,” Shirah joked. Beer geeks can take a tour through the brewhouse and almost always expect to find unique offerings on tap that they’re not going to be able to get in retailers or restaurants. “Our goal is to make one new beer a week for the remainder of the year. You have to be nimble to get people what they want, and they want versatility,” said Shirah.